Pneumonia is an infection of the alveoli. 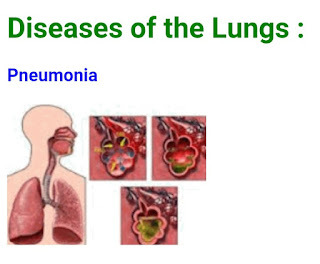 It can be caused by many kinds of both bacteria (e.g., Streptococcus pneumoniae) and viruses. Tissue fluids accumulate in the alveoli reducing the surface area exposed to air. If enough alveoli are affected, the patient may need supplemental oxygen. airborne particles to which the patient isallergic.